Although the Summer is now over and I'm looking forward to warm, cozy nights in, one thing I am not ready to let go of is my coral hues. For years I was convinced that coral shades didn't flatter my complexion, but over the past couple of months I haven't put them down. Today, I have put together a few of my favourite coral lip shades that go with everything and compliment my skin tone perfectly. 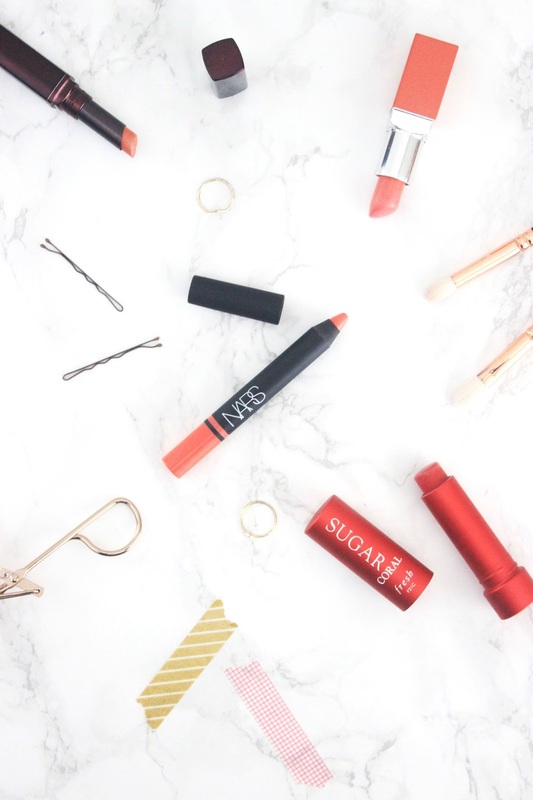 Nars Satin Lip Pencil - Lodhi | As the name would suggest, this bright, bold coral shade has a satin finish that sits comfortably and glides smoothly onto the lips. Although Lodhi is bordering on being an orange hue, I still find that it's an easy stain to wear during the day and it is flattering to wear with a minimalistic make up look. With a strong colour pay off, this shade wears well on the lips despite being a more hydrating formula than other lip pencils on the market. If you're looking for a staple shade that will add some va va voom to your collection, then Lodhi is your guy. 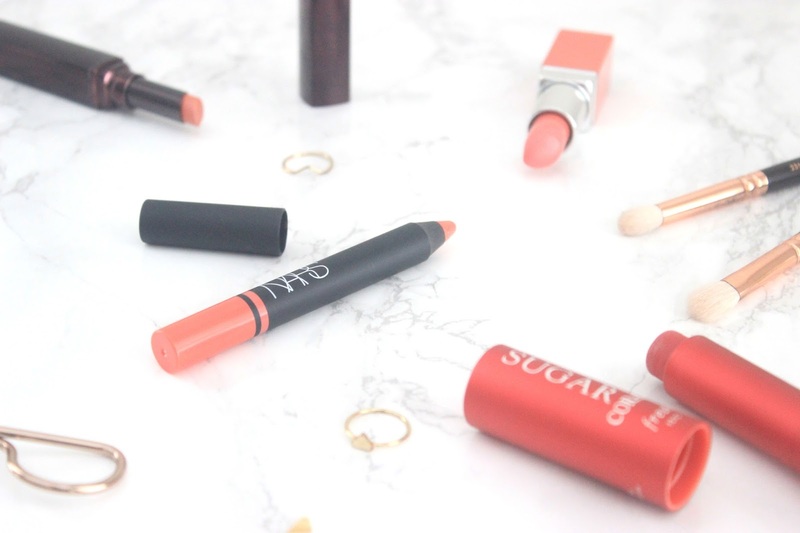 Fresh Sugar Lip Treatment - Coral | The Fresh Sugar Lip Treatments have quickly become a staple in my make up at the moment and Coral- an everyday, subtle tone- is the shade that I seem to be wearing a lot recently. With a super hydrating formula that gives off a light wash of colour, this hue is perfect for those that are just getting into wearing coral shades. Enriched with brown sugar and essential oils that reduce moisture loss and nourish the lips, the Fresh Sugar Lip Treatments are a perfect combination of a lip stain and a balm. With added SPF and a hydrating formula, it's no wonder my collection has continued to grow. Laura Mercier Rouge Nouveau Lip Colour - Play | Play is a lightweight, shimmery peach shade that is the lightest of hues in this post. With a semi-matte finish that promotes fuller looking lips and a hydrating formula that makes it comfortable to wear, this shade is every bit as moisturising as it is pigmented. It leaves a subtle sheen and coral tint to the lips which can be worn on its own or sheered out further to resembled a tinted lip balm. Clinique Pop Lip Colour - Melon Pop | If you're an avid reader of my blog, then it'll come as no surprise that the Clinique Pop Lip Colours are a favourite of mine and Melon Pop is no exception. With a hydrating formula and wearable finish, this is a great product to throw on whenever you're in limbo over what shade to wear. I apply this shade straight from the bullet and with a buildable texture, I can go from a sheer finish to a bold lip in seconds. This lipstick is a must have and perfect for those who are looking for a transitional Summer to Autumn coral shade. What coral lip products do you recommend?